The Maritime and Port Authority of Singapore (MPA) recently announced that it would renew its MoU with the Port of Rotterdam Authority (PoR). The MoU is focused on cooperation in Information Exchange and Research and Development (R&D) at the sidelines of the 4th Port Authorities Roundtable (PAR) held in Long Beach, USA from 16 to 18 July 2018. The Port of Long Beach is the first USA port to host PAR. Since the commencement of the MoU in 2015, MPA and PoR have been working together to innovate in key areas such as maritime cybersecurity, LNG bunkering, and Next Generation Vessel Traffic Management Systems. The renewal of the MoU, signed by Mr Andrew Tan, Chief Executive of MPA and Mr Allard Castelein, Chief Executive Officer of PoR, seeks to further the collaboration between the two counterparts in port digitalisation, port services, port safety and operations and handling of autonomous vessels in port. Mr Tan said that the renewal of the MoU between PoR and MPA reaffirms the commitment of both parties to jointly collaborate and exchange best practices and new ideas. Collaboration in maritime cybersecurity, LNG bunkering, and innovation not only fosters partnerships between MPA and PoR but also benefits the maritime innovation ecosystem. Mr Castelein noted that in a rapidly changing world, it has become more important than ever to join forces with other international partners to see how we can make our ports better, safer, smarter and more efficient. He added that together, MPA and PoR will continue working on the port of the future by exchanging knowledge. Inaugurated by MPA in 2015, PAR is a key platform for leaders of port authorities to gather and discuss key issues of mutual interest, exchange best practices and promote closer collaboration. PAR 2018 was hosted by Long Beach with the theme “The Port of the Future” and topics discussed included optimising port operations of the future, integrating ports and cities: sustainability & stewardship, protecting ports in the future and preparing the workforce of the future. 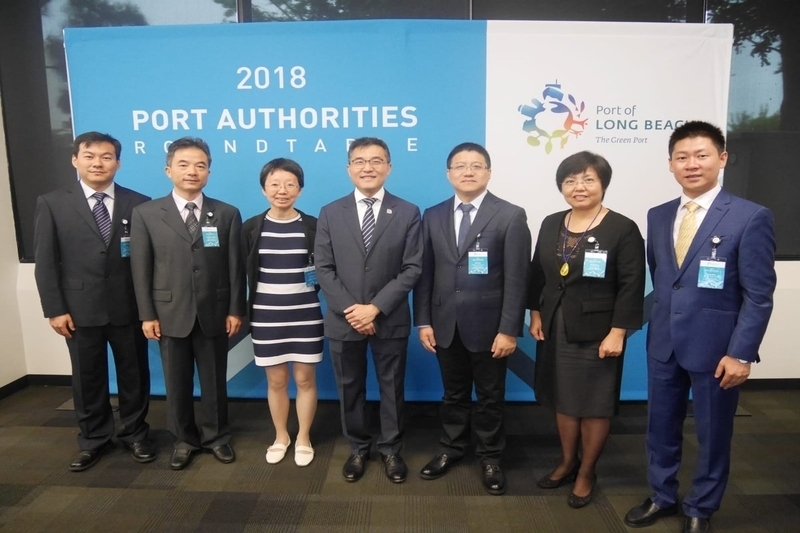 PAR2018 saw a total of 14 participating port authorities, including Shanghai Municipal Transportation Commission, Montreal Port Authority, and Barcelona Port Authority which participated for the first time. Mr Patrick Verhoeven, Managing Director of the International Association of Ports and Harbours (IAPH), was the guest speaker at the event and spoke on the “Emerging Trends Affecting Port Authorities”. He explained how geopolitical developments, shipping strategies, digitisation and climate change present multiple challenges for port authorities worldwide. He added that through leadership in sustainability and deeper forms of cross-border cooperation, port authorities will be in a stronger position to meet these trends and secure prosperity for their local communities. Mr Tan delivered also segment on “Digital Strategies for Next Generation Port”. He shared MPA’s latest digitalisation initiatives in the areas of port, shipping, and services. He also spoke about PIER71, MPA’s Maritime Technology Acceleration Programme, and MPA Living Lab as a platform to experiment with new concepts of operations. Mr Xiao Hui, Director for Comprehensive Planning Division from the Shanghai Municipal Transportation Commission said that The Shanghai Port took away invaluable information from the Roundtable and looks forward to promoting common port initiatives through further collaboration. Mr Tan welcome participants of the Roundtable and thanked them for bringing with them their expertise and ideas. He noted that the purpose of PAR was to continue collaborations between like-minded ports for PAR to be a high-level key platform to exchange best practices, new ideas and solutions. These exchanges are key in light of emerging trends such as the automation and digitalisation of the industry as well as maritime talent issues that are affecting port authorities.